HYale junior Danny is the winning narrator of Perrotta's fourth bookD""winning"" not just because he's smart and funny, but also because when it comes to college life, love and misbehavior, the guy always comes out on top. Conflicts in his life are neatly resolved through acts of grace or circumstance. Driving drunk on his spring break, Danny gets pulled over for a busted headlightDby a policeman who turns out to be an old high school friend. At school, the girl he likes calls him out of the blue to say she wants to sleep with him. And back home in New Jersey, his girlfriend, Cindy, pregnant with his child, makes a life-changing decision that leaves Danny free of guilt and responsibility. The resulting portrait is of a picaresque hero who's not just charming but charmed, a befuddled na f easily embracing everything life throws his way. Set in 1982, the novel is studded with references to that era's pop cultureDKansas songs on the radio; Jodie Foster sightings on campus. But the book's appeal is in its idiosyncrasies, not its name-dropping. Danny spends his spring break behind the wheel of the Roach Coach, his father's lunch truck, and must fend off the hostile Lunch Monsters, a gang of New Jersey thugs who want to steal his father's route. 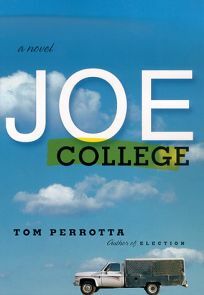 Story lines like that one prove that Perrotta (Election; The Wishbones) is in full control of his quirky comic sensibility, and they make it easy to root for Danny as he navigates his way from his blue-collar past to his privileged future. The novel leaves some loose ends hanging, but after things fall so neatly into place for its narrator, that comes as a reliefDa reminder that art, like life, isn't perfect after all. (Sept.) FYI: Perrotta's Election was made into a film starring Matthew Broderick and Reese Witherspoon.